When I refer to the M-11 below I am referring the “family” of M-11s and not a specific M-11 type. When looking at a M-11 you have to understand a few things. 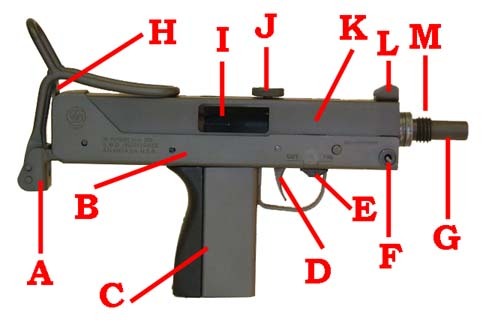 The" MAC" series of guns were envisioned to be a low cost easy to manufacture a submachinegun (SMG). They were designed to be only slightly larger then a pistol but pack the punch of similar SMGs of the day. Since they were designed to be inexpensive, they were produced with a “minimalist” approach. Therefore the sights, finish, & and ergonomics are far from being the quality you would expect in a nice pistol such as a Colt M1911. Without going into a really detailed history lesson in this section my overview is going to be brief. Developed in the late 1960’s by Gordon Ingram at "Military Armament Corporation" (MAC) to work in cooperation with the M-10, the M-11 was chambered in .380 ACP because of its low recoil and the fact that the .380 ACP cartridge was well suited for use in guns with suppressors because the round is generally subsonic. As the various companies that produced these guns changed hands, it spawned a number of M-11-based weapons utilizing both the .380 ACP & 9mm LUGER cartridges. More M-11s have been made overall than M-10s, and I have chosen the SWD M-11/NINE for the section below because it is the most represented (largest number made) of the M-11 family of weapons. Refer to the M-11 Models section on the menu to the left to get a more detailed look at each “member” of the M-11 family.